What to make of last night's meeting of the European Research Group, that gathering of the most backward and broken of the parliamentary Conservative Party? "It was truly mind blowing" said one of the participants, adding "You felt the ground opening up under your feet. The most amazing thing was that no one even bothered to mime a pretence of regret”. What was "amazing" and liberating was for their muttered tearoom conversations to come out in the open, to cast aside the subterfuge and two-facedness and do something exceedingly rare in full view of one other. They were honest. Unfortunately for Theresa May, the ecstatic reviews were for their plot to remove her as Prime Minister. All 50 of these most Brexity of Brexiteers wanted her political career on a platter, and were no longer afraid of letting the world know about it. Okay, well done chaps. You've had your fun and unburdened your consciences, so what now? Alas, there was no what next from our Mogglodyte friends, no strategy or even unity around what needed to be done and when. It's a bit like our silly Labour right wingers who tell the world what they want Jeremy Corbyn gone, but cannot come to agreement about how to do it. Still, that is a bit unfair to the ERG because they have at least taken the trouble of offering a political alternative to their leader, unlike others I could care to mention. Nevertheless their press push today on the Irish border issue was unlikely to put the sweats on the Prime Minister. I mean, if they wanted to pressure May they needed to have a DUP politician in their line up, not David Trimble who, you might recall, was dumped out of the Commons by the Paisleyites some 13 years ago. 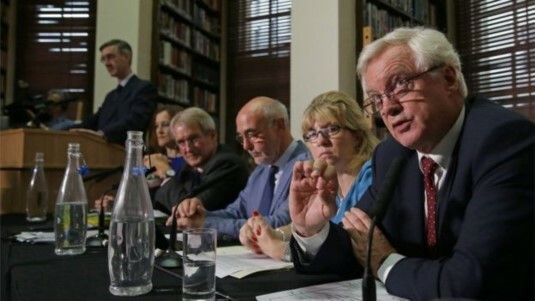 Still, what was most interesting about their line up - featuring David Davis, Jacob Rees-Mogg, Theresa Villiers, and Owen Paterson - was the tone of the thing. This was less a conference called by hardliners confident in their ideas, but a motley bunch pleading for a hearing. As Mogg said, anyone with an open mind can see this was a serious contribution to the debate. And looking at it, there is more substance to it than the ERG's usual ravings. It could be a go-er, if the will was there. But the issue is settled as far as May is concerned, and that is for the UK to remain in a customs arrangement with the EU but, sshhhh, we're not allowed to call it that. As we've seen more times than I care to mention, the factional balance in the Tories is on a knife's edge. May's got the job and she's menaced by many a faction and PM wannabe, but no one, no one (least of all an idler like Boris Johnson) wants the keys to Number 10 while Brexit is dumping toxicity all over British politics. Getting shot of May would only catapult someone else into exactly the same unenviable position, so better wait it out and hope things improve. The problem the ERG have, and they know this well, is that none of them could muster enough MPs for the necessary leadership challenge or get one of their number in the final run off with the membership. Their hope is to throw their lot in with Johnson, but he's neither dependable nor guaranteed to get through to the final two. Or, they could threaten to derail the final Brexit vote. It's looking likely that May will come back with an even more watered down version of her Chequers position, and one that rebellion-minded Labour MPs might be moved to nod through. If not this, then stopping her Brexit deal means the government falls and Jeremy Corbyn becomes the favourite to form the next government. Between leaving the EU and allowing in a party they think is about to expropriate the expropriators, don't be too surprised if the majority of our ERG Brexit rebels turn tail and support May. Their tough talk hides their impotence, and eventual surrender. The only question is how long are they going to keep this pantomime going.